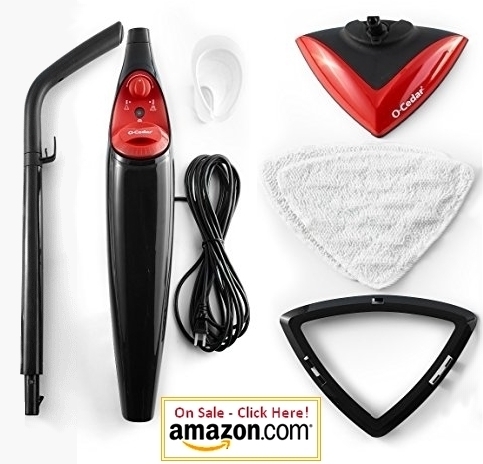 If you are looking for a steam mop that is user friendly, budget friendly, ultra lightweight, does the job well and is easy to use: the O-Cedar Mop Microfiber Steam Mop is for you. This no bells and whistles steam mop is an excellent budget buy at around $60. Despite its seemingly flimsy look and barely weighing more than a broom, it is surprisingly sturdy and hard wearing. This handy steam mop ticks all the expectation boxes you might have for a everyday light to medium cleaning tasks steam mop: It is easy to operate, will glide with ease into hard to reach places that usually have to be cleaned by hand and your floors will be clean in no time. A limited amount of Vileda-branded mops were sent out to avoid an out of stock situation at O-Cedar. Vileda is the sister company of O-Cedar. Their products are 100% identical and the warranties are exactly the same. Easy and quick no-brainer assembly. The cord is a handy 18 ft long. The dimensions of the triangular mop head are 9x9x12 inches and it is widest at the back. It is 4 ft 3 inches tall (51 inches.) The weight is a mere 5pds. The ‘on-off’ switch is at the back and the green indicator light on the front panel will shine when it is turned on. 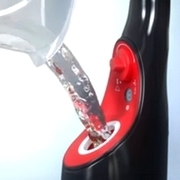 The water tank is build in and takes two cups (400ml or 13 ounces) of ordinary tap water. Instructions are included in the guide on how to de-calcify the mop if needed although it is advisable to use distilled water if you live in a mineral rich area. It takes 15 – 20 seconds to heat up. The continuous steam feature supplies a steady supply of steam until it runs out of steam or is switched off. The ‘low’ setting if perfect for light every day cleaning or when you need to be careful with a floor that can be damaged by heat. The ‘high’ setting does quick work with deeper cleaning tasks and can safely be used on tougher floors such as tiles. The triangular shaped swivel head fits perfectly into corners and is small enough to reach into smaller spaces like behind the toilet. 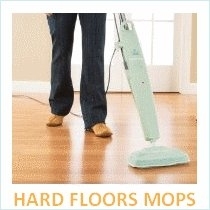 The 2 microfiber mop pads gobbles up dirt, small particles and dust. 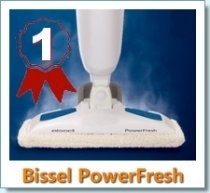 No chemicals are needed since the steam disinfects and kills bacteria. The mop pads can be machine washed (up to 25 times) and are very easy to attach and remove from the mop head. A clip-on carpet glider will freshen up carpets. 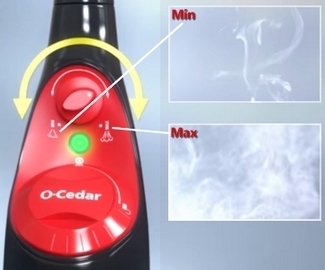 Everything about the O-Cedar Microfiber Steam Mop is easy. There is nothing complicated to understand or to figure out. Easy does it. It heats up in seconds – no more waiting. It truly glides easily and smoothly over floors. The triangular shape of the swiveling head ensures that it maneuvers perfectly into corners and hard to reach places. It stands by itself – no need to lean it against something. Very lightweight at 5lb and small enough to store easily. It is perfect for arthritis suffers or those who have back problems. The steam pad sticks on with Velcro and is very easy to attach and remove. Very quiet – the only sound you’ll hear is steam hissing. No need to hold a trigger for steaming. It is either ‘on’ or ‘off’ and steams continuously. Despite the many many positive reviews the one negative that were mentioned by several customers is that it is impossible to know when the water in the tank is running out. The water tank is not transparent and the amount of water in the tank can at best only be guessed at. 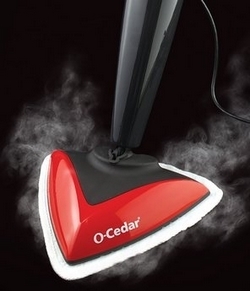 The O-Cedar microfiber steam mop is a marvel of convenience but in this you will have to listen out for the sounds of the steam output to change to pulling sounds and watch to see when the amount of steam emitted starts to lesson to let you know the tank needs refilling. This is only a minor irritation and takes nothing away from how well the O-Cedar works, you will quickly learn to read the telling signs of an empty water tank. Fill up and 20 seconds later you are ready to go! It is a good idea to go ahead and order extra mop pads. Most costumers reported that they had to switch to a second pad before they were done cleaning and would have liked to have even more pads. You don’t want to be forced to keep on cleaning with a dirty pad (or stop cleaning to wash the mop pad) when you can use replacement pads without worrying if you have enough to finish cleaning your floor. Just note that ‘Bargain’ or ‘H20’ replacement pads don’t fit the O-Cedar mop since they are too small. The washable triangle microfiber cloths from the Hoover steam mops do fit. The steam pads are machine washable or can be hand washed. When you toss them in the washer be careful to wash them only with other microfiber cloths since they tend to pick up lint from other fabrics. Don’t use fabric softener because it reduces their ability to absorb dirt and small debris. 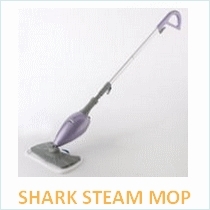 It is prudent to always steam mop wood floors on the low steam setting. If you feel unsure whether your floors can be steamed, do a test run by using the low steam setting to prevent warping or damage.